What shall I thank the Lord for this week? I’m struggling with it right now. Not because I don’t have anything to be thankful for, no. I have plenty, and I am well aware of that, but for some reason tonight my mind just wants to jump from topic to topic, without putting any real thoughts together. The one I can settle on for the moment is, I am thankful for a well-timed chiropractor appointment. As you may remember, I started seeing a chiropractor when Miss Patrice kept going breech before she joined us. I was very emotional and stressed during that time. I didn’t see much joy in the possibility of a surgical birth for our new family member, but that doesn’t mean the Lord wasn’t blessing me through that time. He was. I had a nagging health issue I had given up on it ever improving and other doctors had little help to give. I did not ever think to see a chiropractor for it, but the Lord did. And that health issue has been cleared up. What a blessing! Now, my middle child and hubby see the chiropractor with me. Hubby is seeing some help, though we both wish for more, Sue has had an issue taken care of, and I go for maintenance. This Wednesday was our monthly appointment. I had a miserable sinus headache, you know the kind that make you feel sick, hold your head and rub your eyes. I didn’t think the chiropractor would be able to help me since it was sinus related, I was very willing to be wrong. And wrong I was. It did not take even an hour for the headache to clear up after my “adjustment!” It was awesome. Please head on over and see what others are thankful for. It may be uncomfortable to read the post there, I know it was for me, but it will be good and sweet. The girls woke up in a very good mood today and have been having fun since their eyes first opened! Check out more fun at An Ordinary Mom! This one is over at The Gypsy Mama. The rules are you can write anything you want about the weeks’ topic, but you can only write for 5 minutes without censoring or editing yourself. This could get dangerous! The hubby and I had been married for a little over a year. I was still pretty sick, when we got married, with the Multiple Sclerosis. I was in and out of my wheelchair and doing large steroid doses by IV every 3 weeks. It was keeping me just barely under control. I was talking to my neurologist about me not having children, about making that a permanent decision so we made sure not to have any surprises that I was not healthy enough to care for. I cannot even tell you how much I wanted kids, because I wouldn’t admit it even to myself. I kept saying over and over I was not healthy enough to have kids; kids deserved a strong healthy mama, not someone like me. But my wise doctor said no. He had told me when hubby and I were getting married, “give me two years.” But I just knew that two years wouldn’t bring anything good. How could it when I had been so sick for so many years??? What kind of life was this for kids. But now that I redo the math, by right now, I was healthy and we were starting our family. And I was really sick with morning sickness. I can never tell that doctor how much he means to me. His hard work, and the work of the Lord, brought me to where I am, a mama of 3!!!! Now if we could figure out how to get the company to pay for the free advertising our little cutie did for them…I guess it wouldn’t be free then, but you know what I mean. Our older girls are 3 and 4 years old. They have things they are expected to do like put their dishes in the sink after dinner and clean up their room when told. The former they do quite well, the latter tends to be a battle. Caitlyn starts every time by throwing a fit saying, “Sue won’t help me, I want somebody to help me.” Sometimes this fit goes on and on and on. It makes me crazy. Telling them over and over to do their tasks makes both mommy and daddy crazy. So we introduced a chore chart. They get a sticker for each thing they accomplish throughout the day. It has been fun seeing them work for the stickers. So far, so good, though not perfect. I hear the word is tonight there will be no sticker as they failed in “Go to Bed without a tantrum,” but at the same time it makes the chore chart a success. Now they having something concrete to look at when they do well and something something just as concrete to look at when things don’t go as planned. We’re going to try is and see if it works for them. If they get an adequate number of stickers in a month, they get to go to that kids eating establishment they enjoyed so much. It’s what we are Trying New! What are you trying new? Won’t you link up with me and show off what is working or not working for you? On another leg of the journey. After Caitlyn was born, hubby and I needed to lose some weight. So we joined weight watchers. And it worked, quicker for hubby, but we both lost weight. I found out we were expecting Sue the day I reached prebaby weight. Surprise, surprise, I didn’t get to stay there for long. But it was okay with me. There was a bit more time between Sue and Patrice and I again lost weight. This time I got down to a lower weight than my prebaby weight. 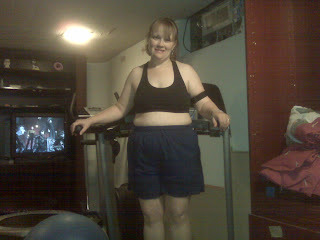 My goal had been 15 pounds under my prebaby weight. I reached it the day we found out Patrice was coming. I stayed there even less time than I did between Caitlyn and Sue. It was definitely okay with me. This time around I have no idea if there will be any more babies in this family. None. I know what I desire, but not what the future holds. So now I will set a series of goals. 1. My prebaby weight for Caitlyn and Sue. 2. My prebaby weight for Patrice. 3. Another 10 pounds down from that puts me at the high number for my height. I would be happy with that. But here is where it starts. So in order to reach these goals, hubby and I are again going to try weight watchers. Would you join us or cheer us on? We would definitely appreciate it! Check out how other bloggers are doing on their journey. We had spring this week. We had 2 days of 50 degree weather. And it was glorious. A lot of snow melted. I went without a coat one day and got to do my running outside. The heart starts dreaming of spring, while knowing it is much too early. It is beautiful. Now it is snowing, there are storm warnings like crazy. Winter is encapsulating us. It is right on schedule. It is beautiful. My girls like to pray at dinner. Caitlyn especially. She always thanks Jesus for a warm house. Today I echo her thanks. 51. For a warm house. 53. For the beauty of snow. 54. For clothes to wear, wash, fold and put away. 55. For too much to eat, so we need to start a diet tomorrow. I am not alone in my thankfulness. Please see what others are thankful for at A Holy Experience. Patrice is learning to play. Yesterday she was really getting into her toys for the first time. She had fun, we had fun. No, I did not let her get in her mouth, but had to get a picture before taking it away! All three of my girls have played on this quilt my great grandma made me when I was very young. Welcome to my 1 year Anniversary Post!!!! I am sitting here wishing I had something totally fun and profound for my 1 year anniversary post, but I got nuthin’! Yup, a lot of nuthin’. I am ever so thankful for blogging. It started as a fun hobby to share pictures and random thoughts and support some blogging friends. It has become so much more. I have “met” some fantastic people through blogging. And gained some amazing prayer support from those other bloggers. The Lord has also used the blogging mightily as I walk through postpartum depression. It was one of the things that became a struggle to continue to do as I withdrew into my darkness, but also became a path back into the light. It started with the Saturday Snapshots over on An Ordinary Mom’s blog and from there I found other blog hops for inspiration and ideas. I will be forever indebted to these bloggers and the encouragement they were to me. Blogging has also become my way to share some information. While I was expecting Patrice, I shared some information about breech presentation babies. I am hoping it helps other mamas if they end up in a similar situation and then when I decided I would share about the PPD, I hope other mamas will find my posts and maybe it will help them walk through the darkness. I have benefitted greatly from encouragement from others in the on-line world and hope I can contribute the same for others. Overall, I see this blog as something the Lord has used in my life and I hope He will use it for His glory as I continue sharing here. Many blessings to you on my blogaversary! Do you ever just run out of time? I do. I have this many things I want to get done and, well, this amount of time or number of days to do it in. I feel that way about Valentine’s Day this year. I had big plans. I wanted to make pink cereal treats and cut them into hearts. I wanted to make heart shape pancakes and cookies. I read about Valentine’s Day Brownie pops on a blog. I wanted to make them; that one, I at least got to the store for the materials, but could not find what I was after, so I bought a candy making kit instead. It was quick and easy and the girls loved it! What plans did you have for Valentine’s Day? Did you get them all done or are you going to try and turn them into spring projects (like I am! )?